Castle Finn with spraypainted messages of defiance sits just off Beachside kayak and paddleboard rental premises in Ganges Harbour. Attempts to remove the houseboat-vessel from the shoal have so far failed. Community members hoping to dislodge a heavy double-keeled boat from the shoal in Ganges Harbour say they have just a few more days to patch remaining holes in the hull and get the Castle Finn afloat before daytime tide levels drop too low to continue until the end of the year. Several islanders assembled at Ganges Alley to watch the progress last week, with multiple attempts starting Thursday. For every person there was a unique opinion on how to proceed, but so far nothing tried has succeeded and the ethics of the effort have been called into question. Community members became involved after the boat’s main resident Jay Seagrave made an online appeal for help along with the owners of the Beachside kayak and paddle-board business, whose property fronts the beach where the ship has lodged. 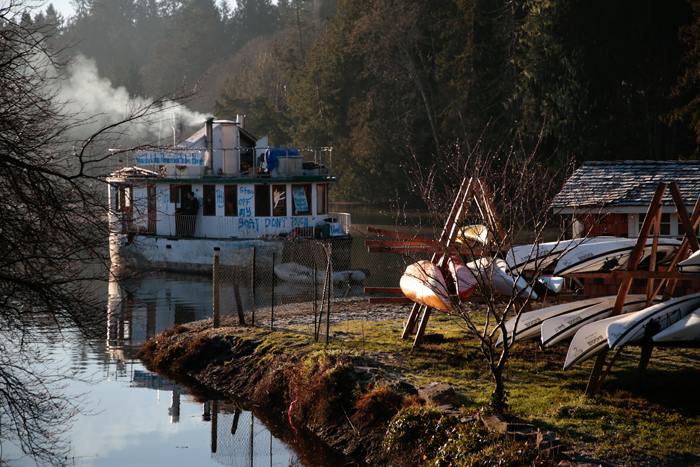 “I grew up on Salt Spring. I want to protect the estuary and the beach,” Seagrave said on Thursday, after an attempt to pull the boat with cables attached to a dump truck failed. Volunteers spent 12 hours digging troughs in the harbour floor’s mud and shell mix on Thursday. Friday’s main effort involved an Island Marine Construction crew attempting to pull the boat out with cables during the morning’s high tide. When that didn’t work, Seagrave turned to blasting material out from under the hull with a pump. Floats and barrels were brought in to increase buoyancy. More efforts were made with trucks on Saturday, but as of Monday the boat was still on the shore, with “king tides” high enough to float it not due back until this fall. Seagrave explained that the Castle Finn had been moored in the harbour when she started taking on water last November. The boat was towed to the shore for repairs with help from the Coast Guard and Eagle Eye Marine Rescue. The ship’s catamaran-style hull is made of ferro-cement, which can lose integrity when the wire mesh starts to rust out. While Seagrave believed all the holes had been been repaired, new ones were discovered during the digging process on Saturday. The problems getting the boat moved have been compounded by the conflicting wishes of the boat’s resident and owner. Seagrave’s mother Dolores Seagrave-Peel, who owns the boat, has opposed much of the process and eventually put a stop to the weekend’s efforts, although she gave written permission for Friday’s activity. The Driftwood made several attempts to reach Seagrave-Peel by email, phone and Facebook but did not get a response. According to her son, she is concerned that the vessel is not seaworthy and about pulling it out to the deeper water, especially during storm season. Meanwhile, community complaints have been made about partying and other activity on the Finn. RCMP Sgt. Ryan Netzer said police have been called to the boat several times. The RCMP has also tried to contact the Coast Guard about possible removal of the vessel from the shore. A licence of occupation is required to undertake any foreshore work or activities. Without tenure there is also no permission to keep the boat on the shore indefinitely, although there does not appear to be legal provision for removing it, either. Beachside owners Jason and Anna Watkin said they have contacted everyone from the Islands Trust to the Department of Fisheries and Oceans for help but were redirected to other agencies at every step. Their efforts have shifted to helping Seagrave make the necessary repairs and get the boat off the harbour floor, whether that’s to dry dock or a mooring buoy out in the harbour. Ironically, the Watkins’ own plans for the beach area were put on hold last year when Islands Trust bylaw enforcement stepped in due to unauthorized alteration of the creekside bank and construction of a retaining wall. Applications for a development permit and development variance permit are now underway. Islands Trust has also become involved, bylaw enforcement officer Karol Kudyba confirmed. A file has been opened and the owner made aware of the relevant bylaws for the Shoreline 6 zone. “Our abilities are limited to the commercial and residential uses of the area,” Kudyba explained. Government bodies will have little power to deal with such situations until new federal legislation to deal with abandoned and derelict vessels is approved, which is expected to take place this summer. The Wrecked, Abandoned or Hazardous Vessels Act will prohibit the leaving of a dilapidated vessel in the same place for more than 60 days without authorization; authorize the Minister of Transport or the Minister of Fisheries and Oceans to order the removal of a dilapidated vessel left on any federal property; authorize the Minister of Fisheries and Oceans to take measures to prevent, mitigate or eliminate hazards posed by vessels or wrecks and to hold the owner liable; and authorize the Minister of Transport to take measures with respect to abandoned or dilapidated vessels and to hold the owner liable, among other items. For now, natural resource and crown land use violations can be reported to the province online at https://www.for.gov.bc.ca/hen/nrv/report.htm.